Here are three brief talks (about 20 minutes each) on Theory of Mind (the ability to ascribe mental states to another person and then use one's sense of those states to explain and predict the actions of the other person). Theory of Mind (ToM) is is also referred to as mindreading, mentalizing, or mentalistic abilities. ToM is one of the key skills necessary for intersubjectivity and empathy - most children begin to develop the skill around age 3. 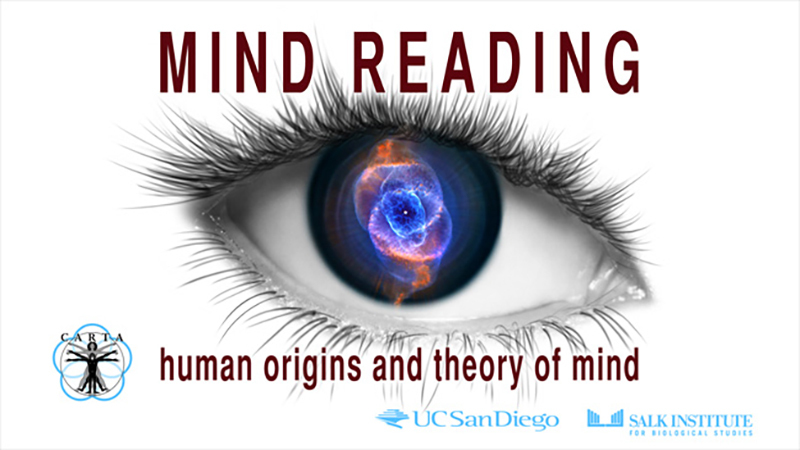 (Visit: http://www.uctv.tv) This CARTA series explores the evolution of "Theory of Mind" (ToM), the ability to impute mental states such as beliefs, desires, and intentions to oneself and others, and how ToM makes us uniquely human. Recorded on 10/18/2013. Series: "CARTA - Center for Academic Research and Training in Anthropogeny" [12/2013]. Ralph Adolphs is the Bren Professor of Pychology and Neuroscience, as well as a professor of biology at the California Institute for Technology (Caltech). Dr. Adolphs received his bachelor's degree from Stanford University, and his Ph.D. in neurobiology from Caltech. He did post-doctoral work with Antonio Damasio at the University of Iowa, beginning his studies in human neuropsychology, with a focus on the recognition of emotional facial expressions. Dr. Adolphs also holds an adjunct appointment in the Department of Neurology at the University of Iowa. Jessica Sommerville is an associate professor in the Department of Psychology, and associate director of the Center for Child and Family Wellbeing, at the University of Washington. She completed her B.Sc. at the University of Toronto in 1997 and her Ph.D. at the University of Chicago in 2002. Following a post-doctoral fellowship, she took her first faculty position in 2003. In 2007, Sommerville was named a Kavli Foundation Fellow. Her research focuses on the origins of social cognition in infancy and early childhood. Sommerville currently receives funding from the National Institute of Child Health and Development and the John Templeton Foundation. Sarah-Jayne Blakemore is a Royal Society University Research Fellow and professor in cognitive neuroscience at University College London (UCL). She is leader of the Developmental Cognitive Neuroscience Group, which focuses on brain development in human adolescence. She studied experimental psychology at Oxford University (1993-1996) and received her Ph.D. (1996-2000) at UCL, investigating self-monitoring in schizophrenia. She co-authored The Learning Brain: Lessons for Education (Wiley-Blackwell, 2005), with Professor Uta Frith, and sits on the Royal Society Vision Committee for Science and Mathematics Education. Blakemore is editor-in-chief of Developmental Cognitive Neuroscience.